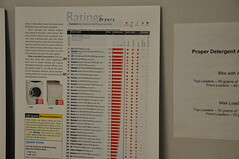 The July issue of Consumer Reports stated there were 1.1 million complaints against North American businesses last year; up 10 percent from 2009. So why are so many people so dissatisfied with customer service ? Jack Abelson, a retail industry consultant called customer service “abominable.” He contends that American business has lost focus on the appreciation and the value of the customer, and excellent customer service is “a profit producer.” Abelson says that organizations cutting their budgets are at fault. According to the study, 64 percent of customers left a store because of poor customer service. Case in point – last week I went to Home Depot to buy a washer and dryer. There was only one sales person on the floor, and there were two other customers ahead of me. The representative said he would be right with us, but that certainly wasn’t happening. Two of us left the store and went elsewhere. On the phone, customer service is even more frustrating. “Your call is very important to us,” leaves most customers mumbling a few choice four-letter words, probably accounting for 67 percent of us hanging up the phone because no one can help us. There are 71 percent of customers who were labeled by the poll as “tremendously annoyed” because we could not reach a live customer representative. There are 56 percent of us who have had to start over and over again through the maze of the automated customer service phone calls, repeat the same answers, ask for a customer service representative repeatedly and seldom get the right person. Interestingly enough demographics show that women get more annoyed and frustrated trying to get a live person on the line than men, but men get “especially annoyed” when a representative tries to sell them unrelated goods and services before even handling the original complaint or resolving their problem. Older people (50+) were more confused with the automated message systems; finding their way through the maze of customer account numbers, the last four digits of one’s social security number, their first-grade teacher’s name, and the product serial number – found underneath the product in the darkest corner of the house. Incidentally Sam’s Club and Wal-Mart scored the worst in customer service in eight of the industries which included appliances, electronics, cellphones, and supermarkets. So doesn’t it just stand to reason that businesses have to change the way they treat their customers? In my own personal experience, Home Depot lost a good appliance sale or two, and AT&T was canceled by me because their customer service was so poor restoring my service when they prematurely cut it off one day and couldn’t resolve the problem efficiently. Mr. Abelson is correct; until organizations appreciate the value of their customers, polls like this will continue to reflect the outrage felt by customers. I found your blog via “Customer Think”; great job! There are so many high-profile companies that are consistently recognized for providing outstanding service and, no coincidence, consistent financial performance. It baffles me, in this copy-cat world we live in, that companies don’t go to extraordinary measures to try to learn from, and emulate organizations like Zappos.com, the Ritz-Carlton, Nordstom’s etc. I guess people like us can just continue to use our social media platforms to continue to praise the great and point out the poor. Thank you Lee. Yes, I agree that companies need to strive to provide extraordinary customer service. You are right – that is why organizations like Zappos and the Ritz-Carlton continue to stand apart and way on top from their competition.